The apartment "Stalla" can sleep 6 guests. It is located on the ground floor, features beautiful vaulted ceilings and opens straight to the garden. It comprises a spacious kitchen with adjoining dining and sitting area (satellite tv), 3 welcoming bedrooms (2 doubles, 1 twin), an attractive shower room. A shaded, private outdoor area is available outside by the pool for al-fresco dining. If required, air-conditioning is available through the apartment (payable locally). The apartment is set within the beautifully restored farmhouse "Podere Romina". “Romina is Tuscany”. In these three words all the soul of this special property can be described. Romina is an ancient farmhouse with swimming pool, perfectly set at the egde of a green hill (”poggio” in Italian) just a few minutes drive away from the pictoresque Cortona. Accessed via a typical alley bordered by cypresses and offering a beautiful swimming pool, Romina is divided into 5 stylish indipendent apartments able to sleep between 3 and 10 people each. Enjoy the beautiful views over the surrounding countryside, or soak up in the sun by the pool: the authentic charme of Tuscany will accompany you for all your holiday. All the apartments have been carefully restored by the owners, Romina and Roberta, are fully air-conditioned for additional comfort, have wi-fi internet and are provided with a private outdoor area for unforgettable al-fresco dining while admiring the views of the gentle hills and vineyards (a barbeque is also available). The owners run a nearby farm, producing excellent wine, fruit, olive oil, marmelade and are always on hand should the clients require anything: traditional tuscan dinners, wine tasting, etc. For this purpose they have specially designated an area in the former barn equipped with a large kitchen and tables that can be rented (small charge payable locally) to accommodate large groups for special events or family reunions. 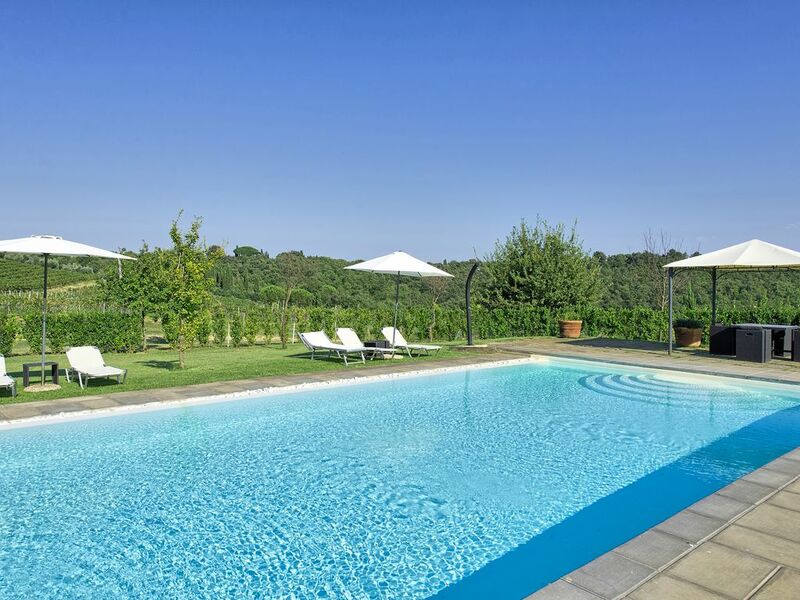 Outside, the large manicured gardens with flowers and scented lavender, are equipped with a generously sized swimming pool (12m x 6m) with sunbeds and shades: a perfect place for relaxing under the Tuscan sun or for a nice refreshing swim. The swimming pool is open from the 15th of April until the 15th of October. Bicycles are also available for the guests should they decide to explore the surrounding area. The interiors are tastefully furnished and there is plenty of outdoor space. The garden is well tended and the pool is set next to beautiful vineyards. Guests can buy the products of the estate (wine and olive oil). Welcome to an authentic Tuscan experience. Da das Haus abgelegen ist (nächster Ort 3 Km), ist es sehr ruhig. Außerdem war das Haus sauber und gepflegt. Die Vermieter waren täglich vor Ort und gaben uns gute Tipps. The sight is breathtaking and we were very happy with the accommodation however what really made it exceptional is the Cooking Class (Chef Allessando Mercorella)we took, on site, pre-arranged by the owners it was an experience to be remembered. Overall we would definitely recommend and return. Eine fantastisch gelegene Anlage oben auf einem Hügel mit grandioser Aussicht, einer traumhaften mit Pinien bepflanzten Auffahrt, sehr gepflegtem Pool und schönem Garten. Die Appartments sind mit sehr viel Liebe zum Detail geschmack- und stilvoll eingerichtet worden und unsere Familie sowie Gäste haben sich alle sehr wohl gefühlt. Die beiden Vermieterinnen Romina und Roberta, sowie die für die Gäste zuständige Betreuerin Martina, waren sehr zuvorkommend, hatten immer ein offenes Ohr für unsere Fragen, und haben uns zusammen mit ihrem Team ein tolles Geburtstagsdinner mit toskanischen Spezialitäten unter freiem Himmel für unsere 36-köpfige Gesellschaft gezaubert. Hervorragend! Ein toskanischer Traum hat sich für uns erfüllt! It’s a stunning property with a wonderful view, big pool and a lovingly manicured garden. The apartments have been elegantly refurbished with a keen eye for detail and we felt very much at home. Romina and Roberta who own the property, as well as English speaking Martina, were extremely helpful in answering our many questions and helping out where they could. They also prepared and served us a wonderful and lavish 4-course open air birthday dinner with Tuscan delicacies for our party of 36 people. Amazing! If you’re after a Tuscan dream, don’t go past this wonderful property! The location is great. The name of this place is Poggio Gabbiano. We couldn't find this name on our booking but all the signs at the road have this name. We had some bad luck with a blocked toilet which caused some bad smells during the week. Another strange thing is that they water the garden every night. Not needed because the grass around the swimming pool was like a swamp. We also found it strange that there were Italian people at the swimming pool. They weren't staying in one of the apartments. It was unclear who they were, family maybe? The owners were a bit invisible, they were not very involved. Their English wasn't great so we didn't get a connection with them. They did try to set up a dinner for all apartments, but we found 30 euro per person, also for the kids a bit much. We had a good stay, the location is beautiful and right in the middle of nowhere. Cortona is a 20 minutes drive away. Lovely town. We would recommend the place, but believe the owners got get more out of it if they would interact more with their guests. Located in one of the most unspoilt areas of Tuscany, with rolling hills and beautiful landscapes, our property is perfectly set just a short drive away from the famous Cortona. The property is surrounded by vineyards and cypresses, in a truly magnificent natural environment: the ideal place to relax and to unwind from the daily routine. The central location allows easy excursions to the most famous cities of Tuscany, Umbria and Latium (such as Florence, Siena, Arezzo, Perugia, Rome) as well as to the Trasimeno Lake (with swimming and sunbathing opportunities) and to the thermal spas. Additionally, for the lovers of shopping, Tuscany offers excellent outlets with designer clothes at unbeatable rates.